An extra refrigerator can always come in handy when you’re entertaining at home but that doesn’t mean that it’s feasible. Maybe your office has a pantry where you can make coffee and stash dry snacks, but what if you pack a lunch and have no cool place to keep it fresh until you eat it? You may just need a small refrigerator for office use to keep your lunch cool or one at home to store drinks and snacks during a party. For all these situations, just get the best compact refrigerator that you can find and it’ll be affordable and won’t take up much space at all. Some types of small fridges are designed in such a way that they utilize the small capacity well with can and bottle storage racks and dispensers. Others are more simply designed to hold a mix of cans, bottles and boxes or small trays of snacks. If you think that you may need to also store frozen desserts or ice cream, then you should look for the best mini refrigerator with a little freezer compartment inside. Before you choose the best compact fridge for your needs, consider what you need it for and where you’ll be using it. Mini fridges come in varying capacities with most ranging from 1 to 5 cubic feet. A smaller one is enough if you’re using it only for a few cans and bottles, but go larger if you intend to keep food cold too. The smaller ones can easily sit on top of your kitchen or bar counter, but you may find that the larger ones are more convenient to use when free standing underneath a counter or in a corner. These compact fridges may come with a mini freezer compartment on top, but it will be large enough for just an ice tray or a pint of ice cream. This kind of freezer should not be used for storing frozen meat or anything else that you don’t want to defrost anytime soon. They can’t keep at such low temperatures for any length of time and you run the risk of food spoilage. For that kind of reliable freezing, look for a mini fridge with a separate freezer door. Mini fridges are anyway less power hungry than regular fridges, but if power consumption is important to you, then look for its rating to see if it is energy-friendly. You have a choice between standard compressor cooling and thermoelectric cooling. The latter is quieter but less efficient. However, compressor cooling in a mini fridge is still less noisy than in a traditional fridge so compressor cooling is recommended unless it’s meant for an office where noise levels matter. If you intend to store several wine and beer bottles long term, then get a mini refrigerator with glass door that’s designed to keep your bottles at a consistent temperature and may even have temperature zones if you want to keep white wines at a different temperature from champagnes, etc. We have separate beverage refrigerator reviews for wine coolers and kegerators if you like to keep cold draught beers on tap at home too. Now that you know what to look for, let’s continue on to review the best compact refrigerator options available on the market. The RCA IGLOO Mini Refrigerator has a reversible door that makes it possible to be opened anywhere and in any space, which is often the case with mini-fridges. At 3.2 cu. ft capacity, it’s ideal for people who may not need a large fridge or who don’t have much space. Because it has an adjustable thermostat with 1 to 7 different temperature settings, you can be sure to keep your food as cool as you may like. As an eco-friendly option, this fridge provides low energy consumption with compressor cooling, which means that your food can stay cool even in hot weather. Its tempered glass shelves can be customized for various item sizes by sliding them into different height slots and can be pulled out for easy cleaning in the sink. It also has a built-in freezer that can fit ice-trays and other items such as supermarket frozen foods. The door has holders for bottles and a can dispenser where you remove the bottom can and the rest move down a spot. There is an interior light, which is rare for this size, making it the best mini fridge for “night prowling”. While some fridges can be noisy, the RCA RFR321-FR230/8 IGLOO Mini Refrigerator functions quietly. 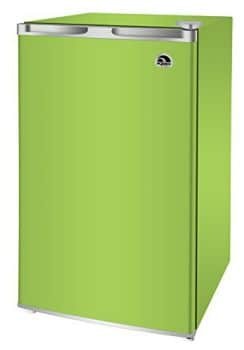 The RCA RFR321-FR230/8 IGLOO Mini Refrigerator comes in 8 different colors, which means users can pick the best color for their home’s color scheme. This lightweight fridge at only 48 pounds measures 19″L x 17″W x 33″H and is easy to move. One thing to consider is that it arrives in poor packaging and often arrives with a dent or two because of this and it’s often difficult to return. The warranty is 1-year for parts and 90-days for labor. The Midea Compact Single Reversible Door Refrigerator has a reversible door that allows for easy opening no matter where you put it in your kitchen or room. The temperature settings are fairly good with a 32° F to 35.6° F range for adjusting and can keep your food cool enough to preserve it. While it does purportedly include a freezer, it doesn’t have the cooling capacity to keep water cold enough for ice and is better equipped for being used a drink cooler. However, most customers say that it keeps everything very cold. It has large compartments for storing bigger items and also includes space for drinks such as large soda bottles and smaller compartments for cans. The Midea WHS-65LB1 Compact Single Reversible Door Refrigerator has a 1.6 cubic feet capacity and a size of 17.7 x 18.6 x 19.4 inches. Keep in mind that the design inside is tapered, making its interior space smaller than you would expect. While it shouldn’t be depended on as the sole fridge in a household, it is convenient for a fridge for drinks in an office, kitchen or dorm. It also comes with adjustable legs, which isn’t always common in compact fridges like this one. The door is made of a durable stainless steel and the body is made from iron. For its low price, it’s a convenient and good quality compact fridge for keeping things cool in the summer. It comes with a 2-year warranty for the compressor and a 1-year warranty for the fridge itself. It does make a bit of noise, so may not be ideal for quiet places or settings such as a shared office or nursery. The RCA 1.6-1.7 Cubic Foot Fridge is compact enough to fit in nearly any small space, whether it be a bedroom or office. While it may be small, it provides quality cooling with adjustable temperatures and Compressor Cooling. Keeping in line with its space saving benefits, it is made with a flush back design, as well as a reversible door that allows it to be easy to fit anywhere you need to put it. The door has enough space for 2-liter soda bottles or large water jars and the fridge includes a cooling space for ice cubes but you may find that it’s not cold enough for that. An attractive feature about this fridge is that its compressor is quiet, making it a good option for those who like to keep their fridge in places that require silence, although it does get noisier over time. It has a 1-year warranty for parts and a 90-day labor warranty. If you worry about having to move the fridge from one place to the next, you’ll be pleased to know that it’s only 33 lbs. It measures 20 x 18 x 20 inches, which is convenient for those who may want an office fridge. Something to consider is that the door is a bit weak and may need some adjusting. The Danby Designer Compact All Refrigerator has a 2.6 cu. ft. interior capacity, which means that it can fit a good number of items for small households. While it doesn’t include a freezer which may be disappointing for some, its cooling temperatures can be as cool as around 36-40 degrees F, which ensures that your food stays cool—but it definitely can’t freeze them. There are two full-width and 1 half-width wire tray in the main compartment. All are removable and adjustable. It has an integrated door handle making for easy opening, and its cord length at 1.6 meters helps to provide users with more options on where to put it. It also includes a space for tall bottle keeping, which is an attractive feature as many small fridges lack this and for those who like beer in cans or soda cans for quick grabbing, the can dispenser is an ideal factor. If you don’t have much space, the scratch resistant worktop is convenient. Because it is an Energy Star compliant fridge, you can trust that it is an energy-saving option for those who like to minimize the energy they use with their kitchen appliances. It’s made from steel and has a warranty for 18 months for defective parts. One downside is the placement of the temperature control setting. It’s on the back of the fridge, making it somewhat awkward-although not impossible-to readjust. With the temperature control placed in a much better location right up top inside, this Danby Designer Compact Refrigerator makes adjusting its temperature a piece of cake. It has a fantastic 4.4 cubic feet capacity and weighs around 64.4 pounds, making it perhaps the best small refrigerator on this list. Although it’s a compact refrigerator, the designers did a good job of maximizing shelf space inside. The exterior is made from steel, as is the door. The Danby Designer Compact Refrigerator includes a fairly decent warranty for 18 months. The slide-out glass shelves make it easy to clean. There are three variations of the 4.4 cu. ft. model, so choose carefully. One includes a vegetable crisper and cover for safe storing of perishables on the bottom, another includes a small freezer with the thermostat right next to it on the top, and the final choice is all fridge – no crisper and no freezer. Also pay attention to the door storage design, as the size and location of the various spaces varies. For example, the egg tray in one model is larger than in the others, but that is because there is an extra space for small jars. The temperature range is between 32 F to 50 F which means you can keep your food nice and cool, especially in the summer. Its reversible door hinges make for easy storing. It also includes a defrost drain. To add to its comfort and functional use, it has an integrated door handle and it includes space for cans which is a huge plus for summer when you want plenty of cold drinks ready for your pleasure. For the convenience and space that it offers, it is a very decently priced refrigerator that is a top alternative to larger fridges for anyone who has a smaller space to work with. Something to consider before purchasing is that the temperature cooling power ends up declining in a short amount of time and if you choose the variation with the freezer compartment, you won’t get true freezing capability. ← What’s The Quietest Electric Kettle on the Market?